Personalised throw blanket made from super soft easy care polar fleece fabric in a soft baby pink colour. 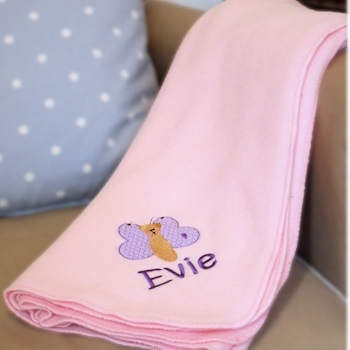 Personalised throw blanket made from super soft easy care polar fleece fabric in a soft baby pink colour. Choose your blanket size, we can make you a small baby size 75x100 cm or a Single 100x150 cm or a Double size 200x150 cm. All sizes are measured approximate. Personalised throw blanket made from super soft easy care polar fleece fabric in a soft baby pink colour. Choose your blanket size, we can make you a small baby size 75x100 cm or a Single 100x150 cm or a Double size 200x150 cm. All sizes are measured approximate. The fleece blanket has overcast stitched egdes and is made from good quality antipil polar fleece that is easy care polyester and is machine washable and air dry. We will beautifully embroider a name or brief message to one corner of the fleece. You choose the thread colour and font style. **Additional charge to have an embroidery motif of your choice. We make the text as large as we can (up to a maximum of 3 inches) depending on the length of the name or message. Please email using the contact us link to the left of this page if you have a special requirement, for examples custom logos, motifs, font styles or messages. This is a fantastic unique gift that is only available at AmysGifts.co.uk. Please allow at least 3-4 working days for us to custom make your order as each blanket is handmade to size and personalised in the UK.